I’m Chris Anderson, the construction manager for this Habitat affiliate. I do lots of different things to help builders build, but my job is mostly being a story teller. 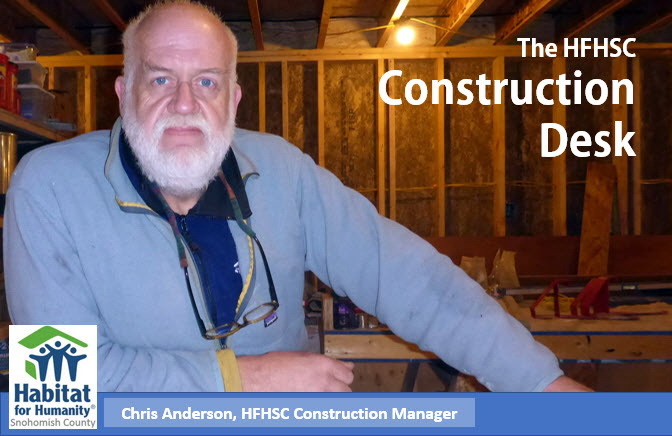 Sharing the latest version of our HFHSC construction story. The things we do to pursue our mission. Here’s how the Construction Desk fits in. This will the hub for that story. Who are we? What’s getting done. What’s next. A place where the different pieces of the story can link together. A common place for all builders to navigate the plan, which is nothing more than our story with enough detail added individual action becomes possible. I want to thank Brooke Burdick, our Director of Community Outreach, for restoring our website, and this blog. Let’s go build stuff!